The dairy industry is an important source of livelihood for the farmers that engage in it. It provides an avenue for income generation for smallholder farmers and contributes to the household asset base through finance and insurance. However, it is the role it could potentially play in intra-African trade and in alleviating hunger and malnutrition that makes it vital. The sector contributes substantially to household nutrition security especially for vulnerable members of society, including children, the invalid and the elderly. Though the CAADP’s four pillars (land and water, markets and infrastructure, food security, research and technological adoption) do not explicitly single out the dairy nor the livestock sector, the role of the dairy sector in fulfilling CAADP’s principles could be read into CAADP’s commitment to alleviating malnutrition in the continent and reduction of stunting among children to 10%. The CAADP Companion Document highlights the general importance of the livestock sector in Africa. There is emerging data that suggests livestock’s potential contribution could be much larger than is currently believed. It has the capacity to contribute to economic growth, alleviate poverty and improve food security. An effective dairy sector is key to achieving CAADP’s principles in most African countries while improving the lives of many communities in these countries. Intra-African trade is expected to triple through the efforts undertaken by CAADP and Agenda 2063 in general with agriculture playing a key role in this growth. The dairy industry is one which provides an opportunity for member states to grow their export volumes and create wealth for millions of smallholder farmers in Africa. In 2013, African countries imported more than $3.6B worth of processed dairy products ranging from whole milk to dried skimmed milk (FAOSTAT). Some of this milk came from overseas markets whereas African countries could have supplied the same. Data from FAOSTAT shows the value and volume of dairy imports by African countries continues to grow, demonstrating a growing demand for processed dairy. This is a signal for the potential of the dairy sector in contributing towards tripling of intra-African trade. A brief analysis of the effectiveness of the dairy sectors in Kenya, Ghana, and India has been undertaken in this think piece as we explore the institutions in the value chain and market aspects that determine the success or failure of dairy & livestock sectors in general. This has an existential impact on the aspirations to triple intra-African trade and contribution to the eradication of hunger, poverty and reducing inequality in Africa. 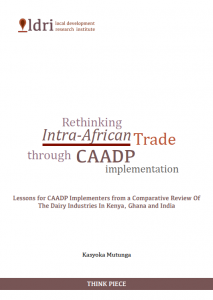 Lessons will be drawn from the analysis, on how best the CAADP’s principles would be implemented and a framework suggested for evaluating the potential of priority commodities in tripling intra-African trade and consequently contributing to wealth creation.